Goodreads: Our lives are a cascade of events that pass faster than we would like them to. Time changes everything. Our habits, our views, our circle of friends. But there is one thing that remains the same over the years. Well today i was jumping up and down like a kid in a candy store! i have been dying for this book since i read songs of the wind! 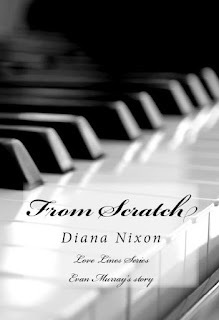 And when i checked my emails today to find Diana had sent me a copy i screamed and bounced up and down! Diana in my eyes is one of the best fantasy authors and i love this series! i had high hopes for the book after reading the other 2 in the series and boy i was not disappointed i read the book in one sit occasionally looking up to mumble something when people spoke to me but that's all! our memories are like a kaleidoscope of images that flash before are eyes reminding us of the bad and the good, the sad the happy, love and hate and as we change and as time goes by we add more memories, we treasure those that brought us joy and hide from those that don't. this is what Evan finds himself doing on Christmas eve, lost in his thoughts of his parents death and lost love, we follow Evan as he looks back in his past and tries to over come the things that haunt him and look forward in to the future! Once again Diana has given us another heart warming and breaking, enchanting story. I liked this book especially for the fact that it is written from Evans point of view and instead of been packed with twists and turns is packed with pure emotion. At moments it is so happy as you follow Evan as he falls in love some bits are heart breaking as he loses his heart! You see a totally different side to Evan that you only saw glimpses of in the previous book, you see a side that is hurt and upset not his normal charming self. but i tell you you will fall in love with him in this book! I just loved it, i loved the writing, i loved the way you got to know Evan, i loved the parts of his past that you got to see and e especially loved the end! !